I should probably come clean right at the start of this and admit that I have a thing about energy saving light bulbs. You might call it a pet peeve. What bothers me about them is not that they give off light of a slightly different hue than I am used to. Nor do I have any reason to believe that they do not use less energy, as advertized. What drives me up the wall is the pious focus on them as a great green savings of energy and/or money. 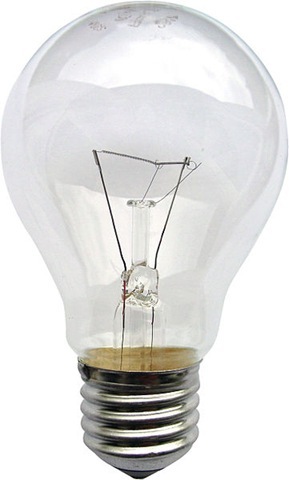 A focus which some years ago resulted in the federal government actually banning the old-fashioned Edison bulb. Do not get me wrong. I agree that switching to energy saving bulbs will save energy. My point is that it will save only a tiny amount of energy. An amount that really only works as a symbolic act, and symbolism is in the eye of the beholder. What some may see as a visible sign that we love the planet is for me a sign we are governed by innumerate twits. I am here referring to both our politicians and the citizens who elect them. Philips has recently started selling the things, which prompted a piece in the Washington Post that, among other things, pointed out that at $50 each, these bulbs do not quite satisfy the stated L prize goal of affordability. Indeed, it is hard to see how these particular LED bulbs are a prize-worthy improvement on the existing offerings. Yes, they produce the light of a 60 watt incandescent with only 10 watts, but that only sounds impressive until you learn that the old LEDs did it with 12.5 watts. And the old ones cost less than half as much money. A round up of eco-friendly bulbs in the Wall Street Journal says the new bulb “works pretty well” and then recommends an $8 CFL instead. This is proudly linked to on the L Prize website. Philips was the only entrant in the prize competition. The bottom line is that our government gave a cash prize to a foreign company for producing something that no consumer in his right mind would ever buy. The Post article makes it pretty clear that retailers would prefer not to waste shelf space on this turkey, but may do so just as a face-saving favor to Philips. The L Prize strikes me as an example of Obamaism at its worst: a cutesy dinner-party-friendly solution to a problem we do not really have. Needless to say, others disagree. Right Wingers Attack Innovative $50 Light Bulb Because They Can’t Do Math is a typically shrill response to the Post item. It focused on a since-removed info graphic not prepared by the article’s author that attempted to compare the lifetime cost of the L Prize bulb to the equivalent number of incandescent bulbs. This graphic was fundamentally flawed for several reasons. 1) It used a much too low estimate of electricity cost. 2) In the context of the article, comparing the $50 L Prize bulb to existing $25 LED bulbs would have made more sense. 3) It is an academic question, as Americans will not be able to buy incandescent bulbs in the future. 4) Totaling expenditures over 30 years is not how you decide which is cheaper. #4 bothers me the most. This is a simple time value of money problem that comes up in consumers lives with some frequency and that everybody ought to be able to solve. In the forlorn hope it will do some good, permit me to walk through the proper way to do the math. I will start with the L Prize bulb vs. incandescents comparison. LEDs last a long time. Indeed, they never really burn out at all. When Philips says the bulb will last 30 years, what they mean is that after 30,000 hours of use (1 year = 1000 hours apparently being the standard assumption) it will have faded to 70% of its original brightness, which will be annoying enough for the consumer to want to replace it. So if we assume the L Prize bulb will last 30,000 hours, and the incandescent alternative will last 1000 hours, then you will need 30 of the old style bulbs to match one L Prize. You can get the incandescent ones for about 50 cents each, at least the cheap ones that only last 1000 hours. To make the calculation both realistic and simpler, let us assume that you will buy all 30 bulbs today, while they are still available. That would set you back $15, $35 less than the L Prize bulb. And what do you get for your $35 in additional outlay if you spring for the L Prize bulb? Why, a lower electric bill, of course. You will be using 50 watts less of power over 30,000 hours, which is 1500 kilowatt hours. At $0.10/kWh, that is a total 30 year savings of $150, which you only paid $35 for. Hooray. Not so fast. $150 dribbled out over 30 years, at $5 a year, is not worth $150 today. To find out what it is worth, you need a discount rate, essentially your expected return on investment. To price the $5 payment in 2020, you need to work out how much you would need to invest to have $5 in 2020. I will assume (very arbitrarily) a discount rate of 8%. And based on that rate, $5 a year for 30 years is worth a grand total of $56.29 today. So buying the L Prize bulb nets you $21.29 in present value. How very exciting. Just for fun, let’s imagine that you lived in a country so permissive that it actually allowed you to buy 60 watt incandescent bulbs during this 30 year period. In that case, going old school would cost you $5.50 a year, $5 in extra electricity and $0.50 for a new bulb. The present value of that cost is $61.91, but you have to pay $50 out of pocket today to avoid it, for a net savings of $11.91. So almost half of the $21.29 savings is due to the government created constraint on buying incandescent bulbs. Furthermore, there are a few unlikely assumptions baked into this calculation. First, 1000 hours a year is about 2 3/4 hours a day of use, which is probably more work than most of the bulbs in your house get. Second, the analysis only makes sense if you are going to stay in your house for 30 years or are the kind of person who would pack up the light bulbs when they move out. And what about the comparison that should have gone with the Post article? Which is cheaper, the $50 Wisconsin-made L Prize bulb or the $25 Chinese-made no prize bulb? The prize winner gets the job done for 2.5 fewer watts, which over the course of a year would save 2.5 kWh, or $0.25. 30 annual payments of a quarter, assuming an 8% discount rate, comes to $2.81 in today’s money. And what is that worth? $10 million, apparently. One thing about LEDs, being children of Moore’s law, is that this $50 bulb will be cheaper next year. The answer to “how much cheaper?” can likely be seen in the previous models’ price trends. At any rate, your analysis is a bit moot, considering that the same people buying $50 LED bulbs will also make the same mistakes buying hybrids. And all of their tree hugging work is undone by the rest of us who hang our 80 inch plasma TVs on the wall connected to 1000 watt surround sound systems. 1. 10 cents per kilowatt hour is today’s rate. You are implying that it is fixed in your analysis. It isn’t. In 30 years, assuming electricity costs rise, you will have saved much more than just $150 in electricity costs. 2. Should electricity costs rise (as expected), then you won’t have to pay tax on the inflationary savings your bulb will be generating. In a sense, these savings are tax free. The same cannot be said of most alternative investments. 3. A 30-Year TIPS (a relatively safe alternative) currently only pays 0.74% over inflation. After taxes, it is likely that all you will be doing is tracking inflation. Your assumption of an 8% return each and every year for 30 years therefore seems like a real stretch to me (at least without taking on a lot more added risk *and* being fortunate). If the bulk of that 8% is made through inflation, then the increases in the cost per kilowatt hour will therefore more than likely fully justify today’s purchase. The math gets a bit more complicated if the price of the LED bulb drops dramatically (as tm suggests). In my opinion, it might be worth waiting to find out. It all depends on how much you actually use the bulb. If it is on 24 hours a day, then you are saving approximately 12 cents per day. You’d save about $40 in a year. It is probably worth it. If it is on 1 hour a day, then it probably is not worth it. Bulb prices could easily fall in one year more than the $2 you’d be saving. And the really strange thing is that the $3 CFLs I use produce the same amount of light with 13 watts…so the upgrade to even the “old” LED at $22 for a 1/2 watt saving seems a bit nuts. As far as energy savings goes, I do take issue with brushing any change in lighting as insignificant. The incandescent->CFL switch saves a little under 10% of a residential power bill, which works out to 2% of American national energy consumption. It’s not a lot, but no single thing ever will be. Energy use is far too varied for there to be magic bullet solution. If you can go so far as to agree that energy conservation is a good thing, you kind of have to accept that no single change will meet any remotely ambitious target. But many little things can add up. Switching to CFLs, particularly as costs have come down through widespread acceptance, was a great example of one small way to reduce energy consumption without reducing our quality of life. I would also suggest that 8% seems to be an increasingly optimistic discount rate. I too switched to CFLs for most of my lighting. I’d like to switch to LED’s for the kitchen and bathroom though. My CFLs take a long time to power up. It’s a pain if you only need the light on for a few moments. I’m also not getting anywhere near the advertised lifespan with my FEIT CFLs bought at Costco. Not even close. The GE ones I use outside and in the garage have been awesome though. I’ve only had one of those burn out in the last 5 years (out of 9 bulbs in use). Here’s another thing to consider. That waste from an incandescent bulb is generated as heat. In the winter where I live, that’s not so bad. That heat is not entirely wasted. It does heat my home. However, for those who live in Florida and use air conditioning, that heat is actually twice as bad. The electricity in bulbs heats the home and then the air conditioner’s electricity has to cool it back down. That’s double the waste. A few other things to consider: Color rendering. The new Philips LED bulb has a 93 CRI, similar to the GE Reveal 60W incandescent bulb that costs $7 apiece. So, apples to apples, you’re talking about a $7 light bulb, not a 50 cent light bulb. The LED has a smoother spectral distribution, not the “spiky” distribution characteristic of CFL’s. This is why people find CFL’s so unpleasant and why they’re not selling. The LED is safer and recyclable. Unlike the incandescent it doesn’t shatter and/or start fires from the heat, and unlike broken CFL’s there’s no mercury to clean up or dispose of. Finally, factor in the time to change burned out incandescent bulbs – especially in difficult or high places; the time to shop for them, etc. If you have 25 bulbs, you’ll change on average 25 incandescent bulbs a year. For me, the new LED bulb is a no-brainer for the high use lights – can’t wait to get some. I, for one, am not bothered by the 8% return rate. Historical market returns are about that (9.4% since 1900). Folks that poopoo that are also the ones that seem to buy in on bubbles and panic sell when everything goes to crap. One other bit of ammo I’d like to mention: We always talk about the cost of one bulb. Now: go count the bulbs in your house. Replacing 50 or so at $50 — even if it is a savings over 30 years — is a big chunk of change to sink into light bulbs. And not all bulbs are 60w rounds… If you want to replace floods and various fancy candelabras, etc… it’s going to add up. And I’m betting the ones that do the replacement are the same ones that will replace them again in 10 years when the next generation bulb comes out. I, for one, am not bothered by the 8% return rate. Historical market returns are about that (9.4% since 1900). Good luck on that theory. Long-term exponential trend failures abound. Folks that poopoo that are also the ones that seem to buy in on bubbles and panic sell when everything goes to crap. I started my Illusion of Prosperity blog on August 31, 2007. You will note that it was several months before the recession officially began. Inbound traffic continues to deteriorate. Perhaps it is time to stick a fork in the consumer. I think we’re done. That was posted one month before The Great Recession. @Spork – using “Market returns” as a reason why an 8% discount rate is reasonable is faulty logic, since it ignores the concept of “risk adjusted returns”. Market returns, by definition, involve risk. Historically, the rate of return you get over a 30 year investment span depends a lot on when your starting point is. The investment discussed here is extremely low risk – the numbers can be known and calculated in advance…like buying a 30-year bond. If you think those are going to be 8% anytime soon, you should consider shorting the bond market. @Mark – if you buy CFLs with electronic ballasts, you don’t have warmup times. I’ve tried a few brands, but now exclusively buy Phillips (despite their overpriced LED products, they do make great and inexpensive CFLs, too). I see a lot of complaints about light color on the internet, but this has always struck me as reflexive opposition to change, and not as a good reason to buy 5 times as much power for the same result. CFLs are also available in a wide variety of colors. As for the heat byproduct: a small source of heat near the ceiling that is on only when you need light (and not when you need heat) is not an efficient way to heat your home. You may require marginally more energy for your furnace, but it will be less than the waste energy you’re saving in your lightbulb. I don’t think its unreasonable to assume 8% discount rate long term. But if you want to go with lower rate then it does change the equation around totally. Lets assume a more conservative 4% discount rate and realistically assume that electricity goes up 2% a year. Then the 50 kwh annual savings starting at average 11¢ per kwh rates equates to around $118 in present value. However I still think that LEDs are NOT a good buy today. #1 reason I think so is that if you simply wait 1-2 years they’ll likely drop in price by a significant amount. 5 years from now I bet LED bulbs will be under $5.